On the surface this appears to be a classic chicken or egg question, until you dig a little deeper. A moment’s reflection on our current understanding of job related burnout (JRB) will offer a responsible answer. It is an observational fact that you can be depressed without being burned out at work. There are several types of depression which are currently recognized. The hallmarks of these mental health issues include symptoms such as feelings of hopelessness and helplessness, loss of interest in daily activities, appetite or weight changes, sleep disturbance, anger or irritability, loss of energy, self-loathing, lack of joy, reckless behaviors, concentration problems, multiple somatic complaints, and somatic and emotional symptoms out of proportion to circumstance. Some of the depression disorders listed above have a genetic as well as an environmental basis. Some are best treated with medication, cognitive behavior therapy, ECT, counseling, or all of the above. Effective treatments can take time. In a previous post I explained the salient features or characteristics of JRB—emotional exhaustion, depersonalization, and a lack of a sense of personal accomplishment. Indeed, the damage from JRB is primarily emotional—emotional blunting, disengagement and detachment from others, a sense of helplessness and hopelessness, and a loss of motivation, ideals, and hope—characteristics very similar to other forms of depression. When people burnout many will act out in an attempt to make themselves feel better, either through the use of drugs, alcohol, or other self-destructive and/or addictive behaviors. The worst way people do act out is with suicide. JRB increases the rates of depression and suicide. There are only two types of JRB—organizational and individual. Organizational JRB has a specific and unique set of causes (six). There is no genetic component which has been identified. Medications will not correct the underlying causes. Ninety percent of the time it is the work environment which must be modified. Behavior modification only works for eliminating individual JRB (10% of cases). Ultimately there are only three remedies for organizational JRB—change the work environment, change jobs/careers, or change yourself. The effects of meaningful change are almost immediate in relieving the symptoms of JRB, including any accompanying work-related symptoms of depression. Given the scope of JRB affecting major working segments of the population and the rapidity of rising rates, it is much more likely that any one individual becomes depressed because they are burned out. Depression and stress are almost always recognized by the individual. Burnout may not be recognized by the individual as symptoms may be incorrectly attributed to some other cause. One wonders how much depression and stress is currently being treated across the US where the underlying cause is actually JRB. Work should be both intrinsically and extrinsically rewarding. It must give people the opportunity to use their unique set of natural talents and abilities, to be creative and innovative in ways that are personally satisfying while serving others. At the same time the work environment should become conducive to engagement, the exact opposite of burnout. The hallmarks of engagement are vigor, dedication, and absorption. This will require a paradigm shift in the mindset of employers. The advantages of doing so are huge. If you are feeling mentally and emotionally exhausted, detached and cynical, lacking any sense of personal accomplishment, and you’re depressed, it’s appropriate to ask yourself, am I burned out at work? If so, just know it doesn’t have to be that way. There are many resources available, including contacting NCPHP at 919-870-4480. 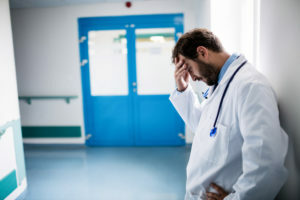 "Job-related burnout", "Physician burnout", "Physician wellness"